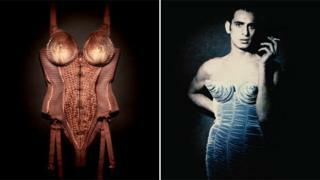 Madonna's conical bra is to go on show at an exhibition to celebrate French fashion designer Jean Paul Gaultier. The singer wore several of the French designer's outfits on her 1990 Blonde Ambition World Tour to support her fourth album, Like A Prayer. They will feature for the first time at London's Barbican next year as part of the exhibition's international tour. "The English were the first ones to come to my shows and appreciate my fashion," said Gaultier. "I am super excited that the show is coming to London. If there is one place other than Paris that I should like to live in, it is London." he added. Many pieces have been created exclusively for Madonna, who has worked with the designer for over 30 years. One sold for £30,000, twice its estimated price, in a Christie's auction in November 2012. The exhibition, The Fashion World Of Jean Paul Gaultier: From The Sidewalk To The Catwalk, is transferring from the Montreal Museum of Fine Arts in April 2014. It features over 140 couture and ready-to-wear pieces which span the designer's career - which began in 1970 as a teenage assistant to Pierre Cardin. Most of the garments come from his own personal collection including outfits for Kylie Minogue, Bjork and burlesque dancer Dita Von Teese. The Barbican described the show as "an installation rather than a conventional fashion retrospective". It will feature footage of catwalk presentations, concerts, music videos, films, dance performances and Gaultier's cult television show, Eurotrash. The exhibition is part of the Barbican's new 2013/2014 season of events. Other shows include Pop Art Design, featuring work by 70 artists including Sir Peter Blake and Andy Warhol. Theatre productions will see David Tennant as Richard II, in the transfer of the production from the Royal Shakespeare Theatre in Stratford-upon-Avon. The Barbican will also celebrate the centenary of English composer Benjamin Britten; the 80th birthday of Sir Harrison Birtwistle; and feature a UK premiere by Philip Glass. Barbican director Sir Nicholas Kenyon said 2012 had been its most successful year and saw a 14% rise in visitors from 2011. More than 70,000 people recently visited a rain room installation, which closed at the weekend.